SPECIAL: Buy all 3 books for just $129 and save $80! LISTEN TO my interview on the "Starting-A-Biz podcast"
FREE with purchase of the "The Bundle"
Dreaming about owning your own pool hall, but struggle with making it a reality? Sounds easy right? Here's the thing, what ties these steps together is a well written business plan. In step one you get your vision on paper. How big is the room you want? How many tables? Is the decor upscale or more working class? What food and beverages will you sell? Do you want a full bar and kitchen? Finally, you need to execute! You have to put in the work. Write the plan, talk to bankers, commercial real-estate brokers and landlords, take bartending or business courses if you don't have the skills, do your research. And along the way continue to update and tweak you business plan. 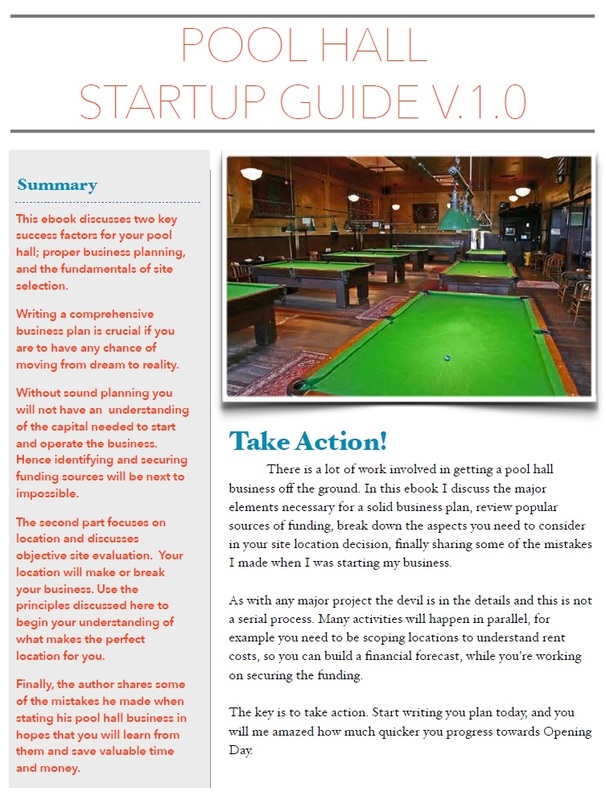 If you take consistent action I guarantee you will realize your goal of owning a pool hall business. Despite all my prep work, I still made mistakes that cost me a lot of money. In this ebook I share my experiences in the hope you'll be empowered to continue with your dream and avoid costly pitfalls. FREE when you buy the three book bundle. Jumpstart your project by purchasing the actual business plan I wrote to secure $640,000 in SBA funding. It's the best $50 you’ll spend because I give you all the necessary elements to write a solid plan. Use it to validate your research and save time. For more information and to order click here. The first purpose of this manual is to help you avoid the kinds of mistakes that cost new owners thousands of dollars. The second is to give you some knowledge about the billiard business which will help you get the best return as quickly as possible. Third, the manual will help you make profits over the long haul by establishing a "customer building" approach to your business. Finally, it will help existing rooms to become more competitive and more profitable. Click here for a preview. The bar is going to make or break your business. After you read this book you will have an understanding of the bar business that would take years to learn on your own. It gives you the know how and processes to interview, hire, train and retain the right bartenders and servers. It includes an inventory control program for liquor, bottled and draft beer, and wine "by the glass". You'll learn how to deter bartender theft, price drinks, increase sales, and the laws related to the bar business. Click here for a preview. You are going to have a lot of questions along the way. I certainly did. The internet, your professional support team, friends and family (especially small business owners) are all great resources to leverage. But there may be times when you need to speak with someone that has done what you are trying to do. Maybe its discussing realistic sales and expense projections for your business plan, or you have questions about location selection, or you simply have hit a wall and don't know what to do next. If you feel you need help, I make myself available for 1-on-1 consultations. To learn more about booking a 1-on-1 Consulting Session click here. My hope is that you find the resources on this site helpful. Remember, you don't have to go it alone. Feel free to drop me a note at PoolHallBP@Gmail.com. I answer every email and love hearing about your success.